Dr. Orysia Kulick received her PhD in History from Stanford University, where she focused on the Soviet Union, Eastern Europe, and the Russian Empire. Her dissertation “When Ukraine Ruled Russia: Regionalism and Nomenklatura Politics after Stalin, 1944-1990” analysed local bureaucracies in Kyiv, Lviv, and Dnipropetrovsk as well as the personal networks that shaped Soviet Ukrainian relations with the Kremlin. With the support of the Petro Jacyk fellowship, she will transform her dissertation into a book-length manuscript, expanding the timeline to include regional elite networks as they evolved from the Stalinist 1930s through the present period. 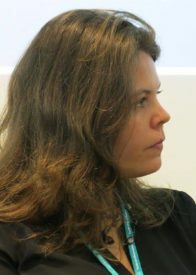 Prior to coming to the University of Toronto, Orysia was a post-doctoral fellow in the School of Languages, Literatures, and Cultural Studies at Trinity College Dublin. Her research was linked to COURAGE, a Horizon2020 funded research project that explores the cultural heritage of dissent in former socialist countries. The project aims to locate existing but scattered archival and private collections about “cultural opposition” in Eastern Europe and link them together in an online database. Twelve partner institutes are located in Hungary, Germany, Poland, Slovakia, the Czech Republic, Croatia, Romania, and Lithuania, as well as Ireland and the UK. Prior to her studies at Stanford University, Orysia worked as a research editor in the investment-banking sector in Kyiv. She also completed a dual master’s degree program at the University of Michigan in 2006 in Public Policy and Russian, East European, and Eurasian Studies. During that time, she received a Fulbright fellowship to Ukraine in 2003-2004, where she researched civic mobilization in the context of the 2004 presidential elections.